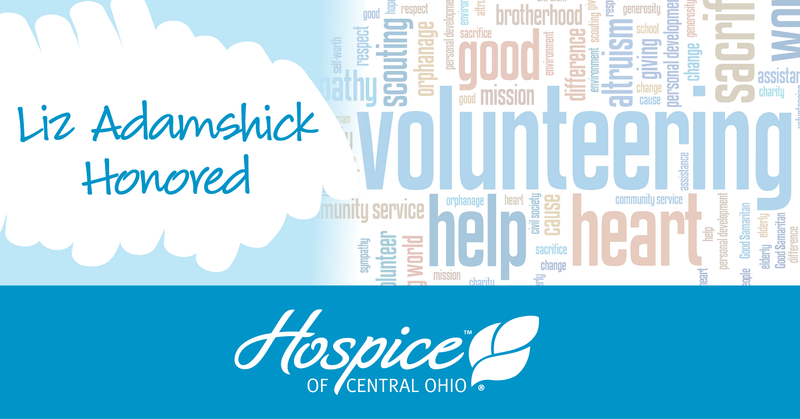 Congratulations to Hospice of Central Ohio Volunteer Services Coordinator Liz Adamshick who was recently honored as the 2017 Outstanding Caregiver Partner by Schoedinger Funeral & Cremation Services in their annual Hospice Caregiver Award ceremony. "Liz works tirelessly to gives her volunteers everything they need to be successful working with hospice patients and families," says Julie Olds, Director of Community Relations and Education with Schoedinger. "She believes strongly in continuing growth through educational and learning opportunities not just for her volunteers, but for all staff as well." Liz worked with Schoedinger in the development of Volunteer Universities, offering inspiring guest speakers and educational break-out sessions for hospice staff, volunteers and the community. "Liz nourishes the partnership between Hospice of Central Ohio and its business partners in the community," notes Olds. "For these reasons and many more, we recognize Liz Adamshick as this year's Outstanding Caregiving Partner." Annual award recipients are selected from those who are awarded monthly recognition in the awards program. Hospice of Central Ohio nominees for January 18 recognition include Newark Home Team Leader Sue Grube and social workers Kelly Stansell and Ruth Robson. Also nominated are volunteer coordinator Pam Scanlon and extended hours RN Michelle Roberts. Liz and these new nominees join an impressive cast of previous Hospice of Central Ohio nominees and recipients of honors in the Schoedinger hospice awards program. The first recipient of the Hospice Caregiver of the Year award was Hospice of Central Ohio social worker Charla Sedziol. Chaplain Mark Pierce has also been honored as Hospice Caregiver of the Month, and nominees have included ICC Team volunteer Kathy McMillen, patient care specialist Vandana Patel, patient companion volunteers Marilyn Dresser and Bernadette Tippie.